Starring: Robert De Niro, Anne Hathaway, and more. Apologies for such a delay in my review work. College mid-terms are so rude to my passion for movies but enough with personal notes. “The Intern” released in theaters across the nation on September 25th, 2015 and has poked at audiences funny bones ever since. Drawing large crowds of all ages. “The Intern” has been quite the under the radar success story amidst a much larger, hype-loaded slate of movies that have been released during the same time. 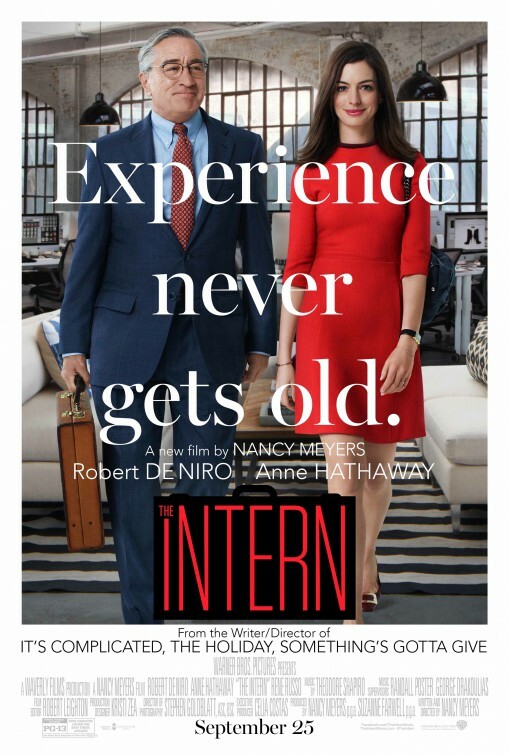 “The Intern” focuses on Ben Whittaker (Robert De Niro), a life-long workaholic whom of which needs to be busy because it is the life he has always known. To add to the list of projects Ben takes on, he comes across a flyer from About the Fit, an online clothing company started and ran by Jules Ostin (Anne Hathaway), and he sees that they have a program searching for “senior interns” targeting older and experienced individuals whom of which are looking for something to do. Throughout the movie, as Ben goes through the motions of being one of the oldest individuals in the company and working under the chief herself, Jules, he begins to foster a strong personal relationship with her and she begins to be close with Ben after she made a point that she is a lone wolf and does not work well with others. As the film continues to focus on this business relationship, the side story of how Jules runs the company and how will she continue to make this business thrive also is a focus and a key thing for the audience to watch develop. “The Intern” is a great “feel-good” movie filled with comedy, a laid-back plot, emotional heart-pulling moments, and it was an overall fun film. I am a huge fan of both De Niro and Hathaway, the two are highly decorated stars in the film world and their ability to create chemistry was worthy of applause. De Niro at the age of 72 still has the same acting magic that he had in his younger days and Hathaway is an absolute gem in every aspect. The film appeals to audiences of all ages with comedic quips that the older audiences can love and appreciate as well as moments that have young adults and adults laughing in their seats. Overall, I enjoyed this movie for a nice change of pace with all the action and diverse plot lines that Hollywood has been dishing out lately. It is nice to relax to a feel-good film with a highly talented cast simply enjoying themselves, as it seems. A fine mix where old meets new.